ProLine PowerStroke SC Universal Shock Mounting Hardware Kit Discounts Apply ! 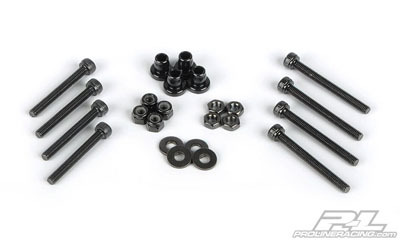 PRO606305 - ProLine PowerStroke SC Universal Shock Mounting Hardware Kit. Now you can mount these race proven dampers to literaly any Short Course or desert truck using Pro-Line's Universal Hardware Kit. This kit provides a direct fit of PowerStroke shocks to Ultima SC, SC10 and Blitz. The included Delrin pivot balls also provide superior PowerStroke shock mounting to Slash� and Slash� 4x4, allowing quicker shock removal and eliminating the dreaded screw back-out.